This green vegetable salad is a great picnic or potluck dish. The avocado pesto-type dressing is creamy and refreshing. Cut broccoli florets into bite-sized pieces, grapes into quarters, and spinach into strips. 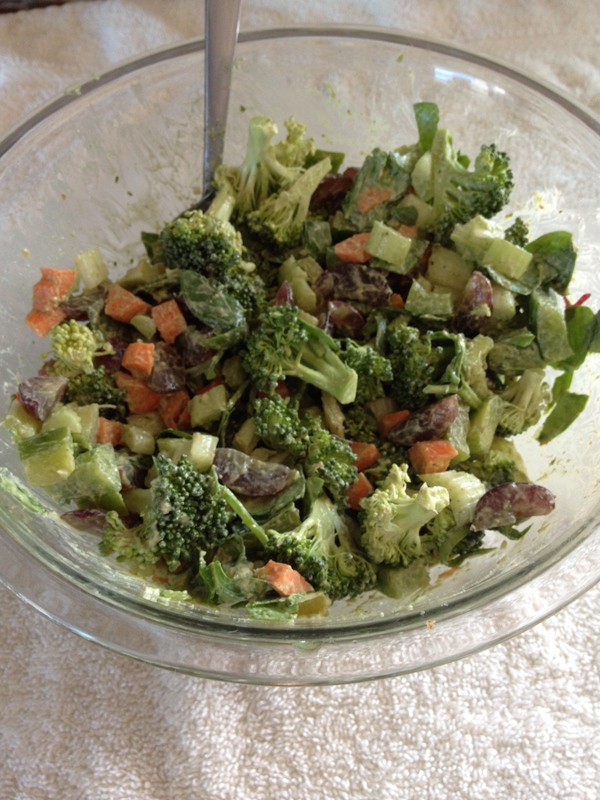 In large bowl, add broccoli, celery, green pepper, grapes, spinach and carrots. In a blender or food processor, blend together the dressing ingredients. Add 1/4 cup of dressing to vegetable mixture and toss well to coat. Refrigerate salad for at least 1 hour before serving. *Note that the recipe will make about 1 1/2 cups of dressing that can be used for other recipes. Only use about 1/4 cup for the salad. If you like, you may add turkey bacon pieces or cooked chicken to the salad for extra protein.